UPDATE: I just keep learning new things with Sharepoint all the time… This is not the best way to createa new list, because SPSite and SPWeb are both IDisposable, and unless you explicitly dispose them, or wrap in usings, you can face memory leak issues. The general approach for sandbox and full trust solutions is the same, but they do differ in a few details. A post by tlhost on the Microsoft Forums titled A SharePoint server is not installed on this computer got me 90% of the way there, this is just filling in the gaps that tripped me up. On your development machine, run regedit and import the nodes. You will now be able to create a Sharepoint Project in Visual Studio 2010. When asked where the Sharepoint server is, tell Visual Studio it’s on your local machine. You will not be able to deploy locally (unless you actually *do* have Sharepoint installed), but you will now be able to create Sharepoint projects, and will be able to package them. Create a project. To test, I simply created a Blank Sharepoint Project (first one was sandboxed, second one was full trust), and added a webpart with a label displayed. Build the solution (so that you generate .pdb files) and then right click on the project in the Solution Explorer and choose “Package”. This will generate a .wsp file, which is actually a cab file (try changing the extension and opening in winzip or similar). If you extract it, you’ll see that in the .wsp is the webpart and the metadata files (xml). Fire up your web browser and navigate to the Sharepoint UI. Click “upload Solution”, navigate to your .wsp, upload it, and activate it. install-spsolution -Identity "SharePointProject4.wsp" -GACDeployment -WebApplication "http://RemoteSPInstallName"
Your solution should now be installed into Sharepoint, you may have to use the UI and go to Site Actions>Site Settings>Site Collection Administration>Site Collection Features and activate your feature from the list before associated webparts become available. Add your webpart to a page. Pull the remote debugger folder from your VS2010 install at: C:\Program Files (x86)\Microsoft Visual Studio 10.0\Common7\IDE\Remote Debugger over to the remote server. Note there is a 64 bit and a 32 bit version. Choose the correct one. Make sure that the account that you use on your local machine also exists on the remote machine. They do not need to be in the same domain, but they must have the same name. Add the account to the appropriate group on the remote machine (administrators?). 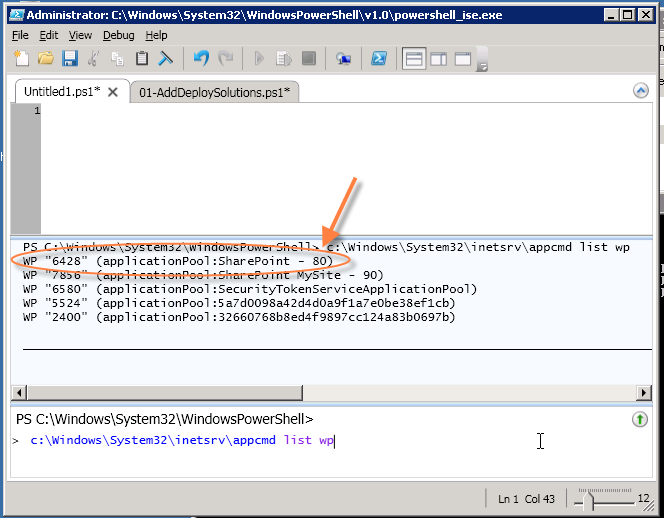 Start the remote debugger “service” by double clicking on msvsmon. Back on your local machine in VS2010, go to debug>attach to process and enter the domain, account and server that you are connecting to. NOTE that the account name is not necessarily your user account (ie the account you ensured exists on the remote machine above). It must be the account the THE REMOTE DEBUGGER IS RUNNING UNDER. 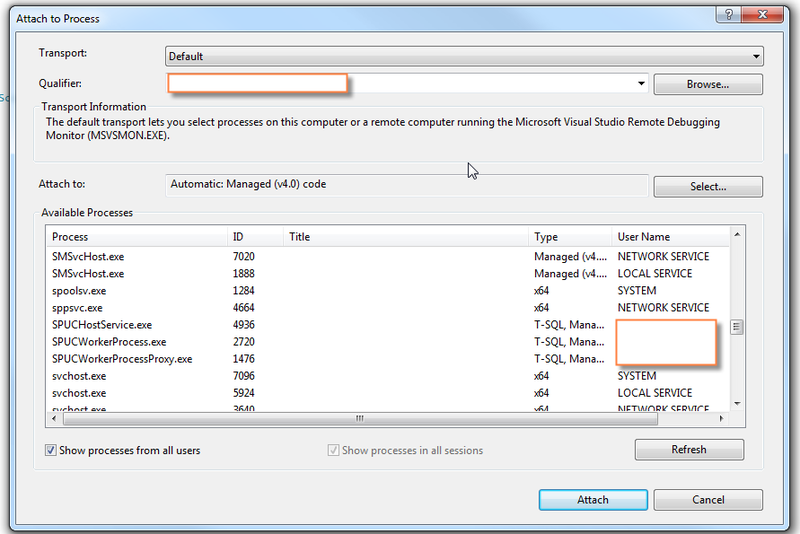 And in VS2010, you should now see the processes running on the remote server. Make sure you select to “Show processes from all users”. Sandbox solutions run in a different application pool than the rest of sharepoint (hence the “sandboxed” part; your webpart could go nuts and it won’t take down Sharepoint proper). Sharepoint will run in a W3WP process, but the sandboxed solutions will run in a process called the SPUCWorkerProcess. Find and attach to the SPUCWorkerProcess. By default, Sharepoint will store the deployed .dll in the c:\ProgramData\Microsoft\SharePoint\UCCache folder on the server. Note that “ProgramData” is a hidden folder, so you’ll have to enable viewing hidden folders and files. I don’t quite understand the logic (ie when precisely it’s triggered), but the folder will change during the lifecycle of the solution. I believe that when the SPUCWorkerProcess gets recycled, Sharepoint will create a new subfolder, but I’m not sure under what circumstances this occurs. Point being, the “active” .dll is in this folder now, but next time you try to debug, it might be in a different one. Reload the web page, and boo-yah, you’re debugging remotely! In some ways, debugging full trust is a little easier, and in some ways a bit harder 🙂 (so I guess that means it’s about the same?) Full trust solutions run in the main Sharepoint W3WP process; however, Sharepoint spins up multiple W3 worker processes, so you have to connect to the proper one. Back in Visual Studio, debug>attach to process and find and attach to the W3WP Process on the remote server that matches the process identified above. Sharepoint stores deployed Full Trust .dlls in the GAC. Reload the web page, and boo-yah X 2, you’re debugging remotely! Does the .pdb *REALLY* have to go in the GAC? I’ve read elsewhere (eg: here) that you don’t have to put the .pdb in the GAC. I haven’t been able to get it to work, however. If anyone has more info on this, I’m all ears. How about updates to my solutions? Uninstall-SPSolution -Identity "SharePointProject4.wsp" -WebApplication "http://RemoteSPInstallName/"